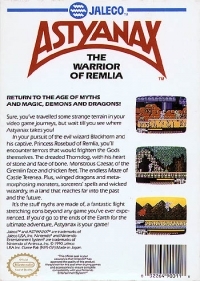 Box Text: Sure, you've travelled some strange terrain in your video game journeys, but wait till you see where Astynax takes you? In your pursuit of the evil wizard Blackhorn and his captive, Princess Rosebud of Remlia, you'll encounter terrors that would frighten the Gods themselves. The dreaded Thorndog, with his heart of stone and face of bone. Monstrous Caesar, of the Gremlin face and chicken feet. The endless Maze of Castle Terenea. Plus, winged dragons and meta-morphosing monsters, sorcerers' spells and wicked wizardry, in a land that reaches far into the past and the future. It's the stuf myths are made of, a fantastic flight stretching eons beyond any game you've ever experienced. If you'd go to the ends of the Earth for the ultimate adventure, Astyanax is your game! 11-11-2013 pacpix Box Text Sure, you've travelled some strange terrain in your video game journeys, but wait till you see where Astynax takes you? In your pursuit of the evil wizard Blackhorn and his captive, Princess Rosebud of Remlia, you'll encounter terrors that would frighten the Gods themselves. The dreaded Thorndog, with his heart of stone and face of bone. Monstrous Caesar, of the Gremlin face and chicken feet. The endless Maze of Castle Terenea. Plus, winged dragons and meta-morphosing monsters, sorcerers' spells and wicked wizardry, in a land that reaches far into the past and the future. It's the stuf myths are made of, a fantastic flight stretching eons beyond any game you've ever experienced. 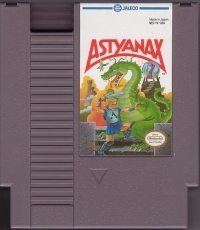 If you'd go to the ends of the Earth for the ultimate adventure, Astyanax is your game! 05-01-2013 smartyhall Box Text Sure, you've travelled some strange terrain in your video game journeys, but wait till you see where Astynax takes you? In your pursuit of the evil wizard Blackhorn and his captive, Princess Rosebud of Remlia, you'll encounter terrors that would frighten the Gods themselves. The dreaded Thorndog, with his heart of stone and face of bone. Monstrous Caesar, of the Gremlin face and chicken feet. The endless Maze of Castle Terenea. Plus, winged dragons and meta-morphosing monsters, sorcerers' spells and wicked wizardry, in a land that reaches far into the past and the future. It's the stuf myths are made of, a fantastic flight stretching eons beyond any game you've ever experienced. 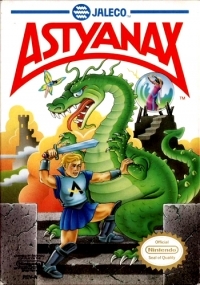 If you'd go to the ends of the Earth for the ultimate adventure, Astyanax is your game! This is a list of VGCollect users who have Astyanax in their Collection. This is a list of VGCollect users who have Astyanax in their Sell List. This is a list of VGCollect users who have Astyanax in their Wish List.